SOCRATES: Welcome Paul. It is good to see you my friend. To what do I owe the honor of this unexpected visit? PAUL: I have been thinking about our frequent discussions about God. After our last discussion I found myself perplexed. I thought I had good reason to deny the existence of God, but you refuted my argument and concluded that the most I can say is that I don't know whether or not God exists. Since then I have been reading through some philosophy websites. I think I have finally found proof that God does not exist. SOCRATES: My goodness, this is exciting news. The discovery that God does not exist would be a most significant metaphysical advancement. I am eager to hear your proof. Please, teach me. PAUL: I'll be glad to, Socrates. I found my proof on the Stanford University Philosophy page. PAUL: Yes, indeed. They have several arguments, but my favorite is the first one. SOCRATES: Please don't hold out on me, my fine fellow. What is the proof? PAUL: Well, it runs like this. If God is omnipotent, omniscient, and morally perfect, he would eliminate all the evil in the world. But evil exists, so there is no God. SOCRATES: A somewhat shorter argument than I expected for such a significant metaphysical conclusion. Are you convinced by this argument? PAUL: Very much so, Socrates. I think this proves that there is no God. SOCRATES: I am not so sure, Paul. Something seems to be missing from the argument. As you have stated it, the most you could deduce from your premises is that God, if he exists, is not omnipotent, omniscience, and morally perfect. PAUL: But God is omnipotent, omniscient, and morally perfect. SOCRATES: Ah, a definition. This is music to my ears. The best way to start is by defining our terms. Shall we proceed, then, with the definition of God as a thing that is, if he exists, omnipotent, omniscient, and morally perfect? PAUL: Of course. Perhaps I took for granted that you would know that. This is indeed how the argument begins on the Stanford webpage. P1. (premise) If God exists, then God is omnipotent, omniscient, and morally perfect. PAUL: That sounds right to me. SOCRATES: Are we happy with our understanding of the terms "omnipotent" and "omniscient"? PAUL: I take "omnipotent" to mean all-powerful. God can do anything. There is nothing that God cannot do. And "omniscient" means all-knowing. In other words, God knows everything there is to know about everything. If he exists, He can see the future and the past. SOCRATES: Two fine definitions indeed. Let us proceed. Shall we break your main premise down into its component parts so that we may see the logic more clearly? SOCRATES: You said that "if God is omnipotent, omniscient, and morally perfect, he would eliminate all the evil in the world". The first part of your premise involves omnipotence. Tell me, how exactly do you think God's omnipotence connects with the existence of evil? PAUL: It is quite simple, Socrates. If God is omnipotent, then God has the power to eliminate all evil. SOCRATES: Very precisely put, Paul. This is a worthy second premise. Let's continue. How does God's omniscience connect with the existence of evil? PAUL: If God is omniscient, then God knows when evil exists. PAUL: That is how it is worded on the Stanford webpage too. 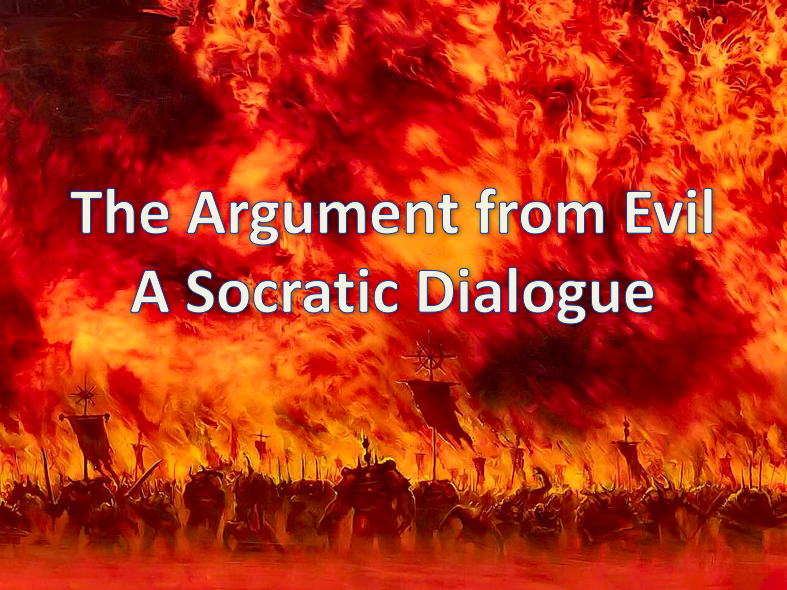 SOCRATES: Now then, my good friend, how does God's moral perfection connect with the existence of evil? PAUL: Well, a morally perfect God would not want evil to exist, so if God is morally perfect, then God has the desire to eliminate all evil. SOCRATES: These three premises form the basis of the argument, correct? P2. (premise) If God is omnipotent, then God has the power to eliminate all evil. P3. (premise) If God is omniscient, then God knows when evil exists. P4. (premise) If God is morally perfect, then God has the desire to eliminate all evil. PAUL: This summary matches the first few premises on the Stanford webpage. Now, evil exists in the world, right? SOCRATES: I am not sure about that, but please continue. PAUL: Well evil does exist and because it does, if God exists then either God doesn't have the power to eliminate it, doesn't know that it's happening, or doesn't want to eliminate it. But God is defined as knowing when evil exists, having the power to eliminate it, and wanting to eliminate it. So, God does not exist. P6. (premise) If evil exists and God exists, then either God does not have the power to eliminate evil, OR doesn't know when evil exists, OR doesn't have the desire to eliminate evil. C. (conclusion) Therefore, God does not exist. PAUL: Yes. This is the argument. This is what I read on the Stanford website. You can see that the premises lead to the conclusion that God does not exist. This is a concise and beautiful proof. SOCRATES: Concise, yes. But perhaps not as beautiful as you think. May I ask you a question? SOCRATES: If I told you that a supermarket was selling everything half price from 12pm to 1pm tomorrow, what would be the first thing you'd want to know? PAUL: I'd want to know what supermarket. SOCRATES: Is it not enough to know when the half price sale will take place? PAUL: Of course not. I need to know where to go. SOCRATES: Well, consider your third premise. It seems incomplete, does it not? PAUL: Oh, Socrates, you're just being foolish. SOCRATES: An interesting response, Paul. Is this a new type of logical refutation? PAUL: Look, I understand what you're saying. But it's obvious, isn't it? If God is omniscient, he knows when and where evil exists. SOCRATES: We can only examine the argument provided using the words provided. As it stands, if evil exists, God would know when it exists; he would have the power and desire to remove it; but he may be unable to do so because he might not know where it exists. The conclusion that God doesn't exist does not follow from your premises. Precision is important, is it not? After all, you are using this argument to deduce a significant metaphysical conclusion. Shall we adjust premise #3 and premise #6? P3. (premise) If God is omniscient, then God knows when and where evil exists. P6. (premise) If evil exists and God exists, then either God does not have the power to eliminate evil, OR doesn't know when and where evil exists, OR doesn't have the desire to eliminate evil. PAUL: Okay. Are you now happy to accept the proof this argument provides? This version is even more precise than the version I read online. Evil exists, so surely God doesn't. SOCRATES: Does evil exist? I am not exactly sure what you mean by "evil". We have left this term undefined. For all I know God may have already eliminated evil from the world, in which case premise #5 would be false and the argument unsound. PAUL: You're being deliberately difficult as usual. SOCRATES: If being difficult leads to a more precise argument, then I make no apology. You are a teacher, Paul. Come now. Teach me. What is "evil"? PAUL: Pain and suffering, Socrates. How's that for a definition? SOCRATES: Forgive me for again seeking clarity. Are you saying that evil is pain and suffering? Or are you saying that pain and suffering are a subset of the things we call evil? PAUL: I don't know what you mean. SOCRATES: Imagine a person who is betrayed by a friend, but she never finds out. Would we not think an evil has occurred? SOCRATES: But there is no pain or suffering because the person never finds out. Would we expect God to intervene in situations of this sort? PAUL: I don't think so, Socrates. The event sounds trivial. I'm considering scenarios that involve pain and suffering. SOCRATES: Very good, then. So, you consider pain and suffering as a subset of things we call evil. Let us then use the term "pain and suffering" instead of evil, since this is what you intend to talk about. PAUL: That sounds fine to me, Socrates. If it helps prove the point I am happy to use the term. P2. (premise) If God is omnipotent, then God has the power to eliminate all pain and suffering. P3. (premise) If God is omniscient, then God knows when and where pain and suffering exists. P4. (premise) If God is morally perfect, then God has the desire to eliminate all pain and suffering. P5. (premise) Pain and suffering exists. P6. (premise) If pain and suffering exists and God exists, then either God does not have the power to eliminate pain and suffering, OR doesn't know when and where pain and suffering exists, OR doesn't have the desire to eliminate pain and suffering. PAUL: Finally. We are finished. SOCRATES: Not quite, Paul. You seem to be in a hurry. Are you willing to continue our examination of the argument? I do not want you to become exhausted on this hot afternoon. The temperature is so high that our thoughts may evaporate. You know that I am interested in coming to understand our subject and that is why I persist in my examination. If you are the same kind of person as me, I'd be pleased to continue our inquiry. I am the kind of person who is pleased to be refuted if I say anything untrue. And I am pleased to refute anyone who says anything untrue. Being refuted, in my view, is a greater good because it delivers one from the worst thing: False belief. I can't imagine there could be anything worse than holding a false belief about the thing we are now discussing. So, shall we continue, or shall we drop it? PAUL: Socrates, I am willing if you are willing. SOCRATES: Then let us continue. Tell me, climate change is an issue that you moderns are most concerned with, am I right? PAUL: Yes. That is true. SOCRATES: I have been told that a partial solution to climate change is to eliminate all the cars that use fossil fuels. Now, will you answer me this: what does it mean to suggest that we eliminate all the cars that use fossil fuels? PAUL: Another question with an obvious answer, Socrates? I get nervous that such questions will lead me somewhere I don't want to go. SOCRATES: You want to get to the truth, do you not? SOCRATES: Then if my question gets you to the truth you should be happy to go where it leads you. So, I ask again, what does it mean to suggest that we eliminate all the cars that use fossil fuels? PAUL: It means taking them off the road. Removing them. Perhaps destroying them. SOCRATES: Nicely put, Paul. Now, if I asked you to eliminate all the ghosts from the world, what would you do? PAUL: Nothing. There are no ghosts. I can't eliminate something that doesn't exist. SOCRATES: Again, a nicely put answer. And I suppose that if there were no cars and I asked you to eliminate all the cars, you would think I had made a strange request. Am I right? PAUL: Yes. As I said, I can't eliminate something that isn't there. SOCRATES: It follows then that pain and suffering must exist in order for God to eliminate it, does it not? After all, God cannot eliminate something that isn't there. PAUL: Yes, that does seem to follow from what we have said. SOCRATES: Isn't your argument therefore invalid? We can't conclude from the existence of pain and suffering that God doesn't exist. Perhaps it takes a billion years to eliminate pain and suffering. What do you think? PAUL: I think something has gone wrong somewhere in the argument. But it came from the Stanford website, so I am surprised to hear you say it is invalid. SOCRATES: We have improved upon the Stanford version of the argument, my friend, and it seems that it is in need of further improvement. The problem is with the word "eliminate", is it not? PAUL: It is indeed. God should stop pain and suffering from occurring rather than eliminating existing pain and suffering. I'm sure that is what is meant by the argument. SOCRATES: Well, we can only know what is stated, regardless of what is meant. Let us adjust the argument again and make it say what it means to say. We'll use the word "prevent" in place of "eliminate". P2. (premise) If God is omnipotent, then God has the power to prevent all pain and suffering. P3. (premise) If God is omniscient, then God knows when and where pain and suffering will exist. P4. (premise) If God is morally perfect, then God has the desire to prevent all pain and suffering. P6. (premise) If pain and suffering exists and God exists, then either God does not have the power to prevent pain and suffering, OR doesn't know when and where pain and suffering will exist, OR doesn't have the desire to prevent pain and suffering. PAUL: This is much better. I think we are getting there. SOCRATES: Shall we examine your second premise? Earlier in our discussion we defined "omnipotent" as all-powerful, did we not? There is nothing God cannot do, right? SOCRATES: So, if God wanted to make the world such that rocks fall towards the heavens instead of towards the ground, he could do so? PAUL: Yes. If God is omnipotent, he can make rocks fall upwards. SOCRATES: And if God wanted to make it the case that there are no insects on Earth, he could do so, right? PAUL: Yes, again. This fits with our definition of omnipotence. SOCRATES: Could God destroy the world? PAUL: If he wanted to, of course he could, because he is all-powerful. But he is also defined as morally perfect, so he would not choose to do so because that decision would cause pain and suffering. SOCRATES: Each of these are logically possible actions. And presumably God's omnipotence only pertains to the logically possible, right? In saying that God is all-powerful, we are not suggesting that he can do the logically absurd. Am I correct? PAUL: I'm not sure what you mean by "logically absurd". SOCRATES: For example, we would not expect God to be able to produce a square circle. PAUL: Why not? If God is all-powerful then surely he could make a square circle, if he so desired. SOCRATES: But Paul, consider what we would be asking of God. By definition a square is not a circle. We would be asking God to create a circle that has four straight sides of equal length that sit at right angles to each other. But that is a nonsense request, is it not? A circle, by definition, does not have those properties. PAUL: Ah yes, Socrates. I believe you are right. A square circle would be an impossible object. SOCRATES. Now consider the famous question: if God is all-powerful, can God create a rock that God cannot lift? Putting aside the presumption of gravity and muscular, skeletal limitations which seem irrelevant to God, this appears to be an absurd question, does it not? We can reword the question to: Can God create an unmovable object that is movable? Is this not a nonsense question? It is like asking: is God capable of being incapable? Or, can God tell a true falsehood? Or, can God exist and not exist? These are logical contradictions and therefore sit outside the realm of logical possibility. They are word tricks and have no bearing on God's omnipotence. Do you agree, my marvellous friend, or do you think a thing can at once be both itself and its opposite? PAUL: Your point is well made. A thing cannot be itself and its opposite. So I agree that these questions do not show us anything about God's omnipotence. They are foolish questions. SOCRATES: You must agree, then, that an all-powerful God would work within the realm of logical possibility. Don't hold out on me, my friend, answer me with what you really think. PAUL: Your examples are legitimate, Socrates. I would be a fool not to agree with you based on what you have said. I agree that an omnipotent God would work within the bounds of logical possibility. SOCRATES: Shall we proceed then? Tell me: is it not true that people believe God has given us all freewill? PAUL: This is what they believe. SOCRATES: And according to those who believe God has given us freewill, we are able to choose our actions. We are not restricted. Am I correct? PAUL: Again, this is what they believe. SOCRATES: Now, if people do indeed have freewill, is it not possible that they will sometimes choose actions that result in pain and suffering? PAUL: I understand what you are saying, Socrates. But if God is all-powerful, he could prevent people from choosing actions that hurt others. SOCRATES: But then people wouldn’t have freewill, would they? The ability to decide to cause pain and suffering comes with freewill, does it not? It seems that you think that God could give people freewill while also withholding freewill. Is this not a nonsense suggestion akin to those we were just discussing? And if it is nonsense, have we not demonstrated that your second premise is false? PAUL: It is only nonsense if we assume that God would give people complete freewill. Many believers do indeed think this is true. But I think that is a bad assumption. I think an all-knowing God would know that complete freewill would result in pain and suffering. He would therefore not allow this level of freedom. If an all-knowing, all-powerful God exists, he would not give people complete freewill. SOCRATES: You are a splendid fellow. Are you proposing that God would restrict some actions, such as those that result in pain and suffering, while allowing freewill when it comes to other actions? PAUL: Yes. That is what I would expect from an all-knowing, all-powerful, morally perfect being. But this is not the case, is it? Therefore, there is no such being. SOCRATES: But wouldn’t this restriction mean that people are not truly free? Again, you appear to be arguing for a situation in which people are free but not free, a contradictory state of affairs. PAUL: Let me put it another way. If God is all-powerful, he could have created a world in which people simply do not have the ability to cause pain and suffering. People can be completely free in such a world, but because causing pain and suffering would be beyond their reach, people would be unable to bring about their occurrence. Just as people do not have the ability to fly unaided, God could make it that they do not have the ability to cause pain and suffering. SOCRATES: Is this not a restriction? PAUL: Not in the same way as God actively preventing people from causing pain and suffering. I'm imagining a world in which the ability to cause pain and suffering is beyond our reach. We don't complain that people are not free just because they can't fly. So why would we complain that people are not free simply because God did not allow for them to cause pain and suffering? SOCRATES: You are teaching this old man gently, Paul. Perhaps I should enrol in your school. Would you please teach me some more? Let us examine your current claim by testing the truth of your fourth premise, that a morally perfect being would have the desire to prevent all pain and suffering. I have a question about the morally perfect being. What sort of world would a morally perfect being create? PAUL: A good world, of course. A morally good world. SOCRATES: Then if God could choose between creating two possible worlds that differ only in the degree of moral goodness, he would create the morally better of the two? PAUL: Yes, and clearly this is not the world we live in. SOCRATES: Whether this is clear is yet to be decided. It will be decided by following our common master. SOCRATES: I used to call it my daimonion. It is a voice that speaks to me and it can speak to us all. It is our inner reason. Our logic. PAUL: You speak in riddles, Socrates. What is that term you use? Sophistry? You talk like a sophist. Fancy words, but no substance. SOCRATES: The substance is yet to emerge my friend. Its current obscurity does not entail its non-existence. SOCRATES: No more riddles then. Come now, let us continue. Imagine two houses, each containing a three-year-old child and a cookie. In the first house, the cookie is hidden high in a cupboard, completely out of reach. That child cannot possibly eat the cookie. In the second house, the cookie is sitting in plain view on the kitchen table. The child can eat that cookie if he so wishes, but he decides not to because doing so would violate his parents’ trust. Can you answer me this, and please answer with what you really think so that our dialogue doesn’t break down for the wrong reason. In which situation is the child's action most morally admirable: the one in which the child is restricted and cannot possibly eat the cookie, or the one in which the child decides for good reasons not to eat the cookie? PAUL: The second one, of course. SOCRATES: Is it not true that the same applies to possible worlds? Imagine a world in which God has placed restrictions on people so that they cannot cause pain and suffering. Now, imagine another world in which no such restriction exists, but people decide not to cause pain and suffering because doing so is morally problematic. Which of the two possible worlds contain people who make the most morally admirable decisions about pain and suffering? PAUL: Again, it would be the second one. SOCRATES: Would not a world containing the most morally admirable people be considered a world of the highest moral worth? PAUL: Yes, it would seem so. SOCRATES: And would not a morally perfect God create a world that is of the highest moral worth? PAUL: Sure. But people usually don't choose not to cause pain and suffering. Quite the contrary. People choose to cause pain and suffering all the time. So our world isn't like the world you described. SOCRATES: Well Paul, presumably it would take time for the child to learn that it is wrong to violate his parents' trust. But when he does, we have agreed that the resulting situation is better than the alternative restricted situation, have we not? PAUL: Yes, we agreed to that. SOCRATES: Is it not the same in our world? Perhaps it takes time for free beings to learn. But is it not true that a world in which people choose freely not to cause pain and suffering is of higher moral worth than a world in which people are unable to cause pain and suffering due to restrictions put in place by God? SOCRATES: So, we are agreed that a morally perfect God would not desire to prevent people from causing pain and suffering because doing so would result in a world of lower moral worth than one in which people are free to decide. PAUL: If having the ability to cause pain and suffering, but choosing not to, makes for a morally better world, then I agree. But you are forgetting that not all pain and suffering is caused by human choice. Much suffering is caused by natural events; for example, famine, earthquakes, volcanic eruptions, tsunami. God could surely prevent these from occurring. SOCRATES: Why is there famine in the world? PAUL: It can be caused by drought, ongoing crop failures, and over population in certain areas. SOCRATES: Which means there isn't enough food to feed everyone? SOCRATES: But is it not the case that some countries produce surplus food? I have heard of large stockpiles of grain. I have also read that a country called the United States disposes of surplus milk. You can read about it too: "Dairy Farmers Dump Milk"; "Got Milk? Too much of it"; "America has 1.2 billion pounds of excess cheese". If food was distributed differently, is it not possible that there would be no famine? If so, is it not the case that famine is the result of wealth distribution, which is a product of the moral decisions of free people? PAUL: Okay, I accept that famine can be caused by human decisions. SOCRATES: Now, there are many examples in which people have freely decided to give money to help reduce famine, are there not? Is it not true that such cases illustrate morally good choices? PAUL: Yes, I agree to that point. SOCRATES: And because we agreed earlier that God would favor a world in which humans are free to make such choices over a restricted world, this world must contain the possibility of famine. PAUL: This would seem to be correct. But what about the other causes of pain and suffering I mentioned? God could, and would, surely prevent them. SOCRATES: Would he prevent these other causes of pain and suffering if doing so meant losing something that contributes to a morally better world? PAUL: No, but what would such a thing be? SOCRATES: Let us consider this: What happens when disaster strikes? PAUL: Lots of people suffer and die. PAUL: Survivors rebuild their lives. SOCRATES: Do they do this in isolation? PAUL: No. They tend to help each other. And the rest of society usually donates time and money to help. SOCRATES: Why would people do this? What prompts action? PAUL: They feel moved to help because they don't like seeing people suffer. SOCRATES: Would it be correct to label their feeling as compassion? PAUL: Sure. Compassion, sympathy, or empathy. Maybe a combination of these. SOCRATES: In a world with no natural disasters and no pain and suffering, there would be no compassion, sympathy, or empathy, right? PAUL: Probably not. They wouldn't be needed. SOCRATES: But they are valued, are they not? PAUL: They are only valued because pain and suffering exist. SOCRATES: Well, it may be true that these feelings only occur because of pain and suffering, but are they not valued in and of themselves? If we imagine a world without these values, would we not say that such a world is inferior to this world? Even if people survive perfectly well without those values? PAUL: That might be simply a matter of opinion, Socrates. SOCRATES: Again, let us consider which of two possible worlds is of higher moral worth; a world with no pain and suffering, no compassion, no sympathy, and no empathy; or a world in which pain and suffering causes people to experience compassion, sympathy, and empathy -- feelings which prompt them to work together to help people through their difficult situation? If God is morally perfect, he would create the morally better world, would he not? PAUL: When you word it like that I have to agree that the second world is more worthy of moral praise. But I still don't think God exists. Your argument hasn't convinced me of that. SOCRATES: Was I trying to convince you that God exists? SOCRATES: Refuting an argument against the existence of God is not the same as arguing that God exists. I am merely asking questions about the argument you found on the Stanford website. I am trying to learn. PAUL: You always tell me you're trying to learn, but I think you're being ironic. SOCRATES: Well, what conclusion should we draw from our discussion? Did your argument succeed in demonstrating the non-existence of God. PAUL: I am still convinced that an all-powerful, all-knowing, morally perfect God would not create a world like this, full of pain and suffering. But your points are good and I shall work to address them. It seems that my second and fourth premises need to be re-worked. SOCRATES: Ah, my friend, you have a conclusion in mind and you now want to develop premises that properly support your conclusion. Is that the best way of proceeding? PAUL: It just seems implausible that God exists. SOCRATES: Implausible? You must have great wisdom to be able to state the probability of God's existence with such certainty. We are a fine pair, my friend. We have discovered that your argument can be refuted but we still don't know whether or not God exists. And yet you now admit that you have a strong belief that he doesn't exist and you will re-work your argument to support your belief. Shall we meet again to examine your new argument? PAUL: Do I have a choice? SOCRATES: You have freewill, do you not? Of course you have a choice. Lewis, C. S. (1957). The Problem of Pain, London: Fontana Books. Plantinga, Alvin (1974a). God, Freedom, and Evil, New York: Harper and Row.